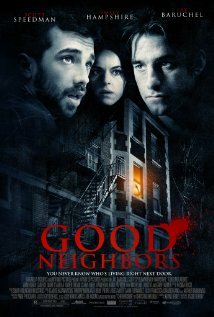 Neighbors Spencer (Scott Speedman) and Louise (Emily Hampshire) have bonded over their fascination with a recent string of murders terrorizing their community. When a new tenant named Victor (Jay Baruchel) arrives in the building, all three quickly hit it off. But as soon as they soon discover, each of them has their own dark secret. As the violence outside mounts, they city retreats indoors for safety. But the more time these three spend together in their apartment building, the clearer it becomes that what they once thought of as a safe haven is as dangerous as any outside terrors they could imagine.